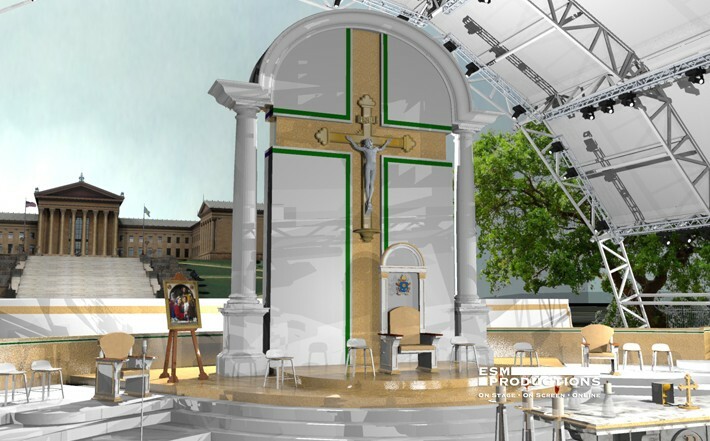 A rendering shows the sanctuary to be built by ESM Productions for the Mass that Pope Francis will celebrate on the Benjamin Franklin Parkway in Philadelphia Sunday, Sept. 27. When Pope Francis visits America he’ll meet a president, governors, Catholic prelates and ordinary folks. He’ll also meet a queen. Aretha Franklin, the “queen of soul,” will belt out quintessentially American music at the Festival of Families on Saturday night, Sept. 26 on the Benjamin Franklin Parkway. She will lead a slate of entertainers offering the pope a glimpse of American pop culture, in all its artistic diversity. The World Meeting of Families, taking place at the Pennsylvania Convention Center Sept. 22-25, announced Monday, Sept. 15 that Franklin and a host of other singers, dancers — even a comedian — will perform on two stages all day and into the evening on the 26th, plus more entertainers preceding the Sunday, Sept. 27 papal Mass on the parkway. Hosting the Festival of Families as master of ceremonies is Academy-Award nominated actor and film producer Mark Wahlberg, Catholic and native of Boston. Also headlining the slate of acts is the Denver-based, Grammy-Award winning rock band the Fray. Franklin, one of the most popular singers since helping to define the Motown sound of soul and rhythm-and-blues music more than a half century ago, has won 18 Grammy Awards over her stellar career. She will perform with previously announced stars including Italian tenor Andrea Bocceli, Latin singer Jaunes and the Philadelphia Orchestra, led by music director Yannick Nezet Seguin. 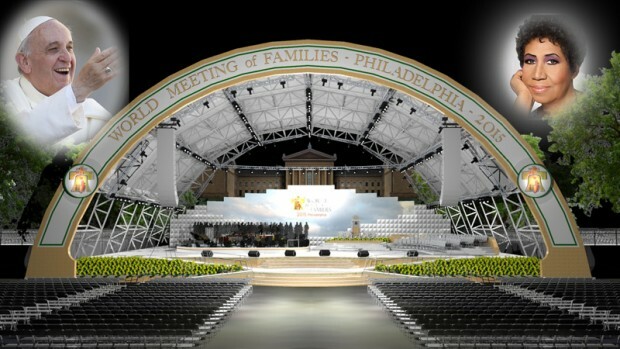 In addition, the Philadelphia-based production company ESM Productions released an artistic rendering and video animation depicting its designs of the small stage Pope Francis will use for his Sept. 26 address at Independence Hall and the stage for the Festival of Families, which will be converted for the following day’s papal Mass. The stage at Eakins Oval on the parkway will be 100 feet across and 60 feet high, open at its rear to show the Philadelphia Museum of Art behind. Before the big stars come out to the Festival of Families, the event at the Eakins Oval stage will begin with American DanceWheels, a group showcasing Latin and ballroom dance for people in wheelchairs; Jackie Evancho, the young classical music singing sensation; Matt Maher, a popular Christian-music artist who will be coming off a performance at AbbeyFest in Paoli a week earlier; Sister Sledge, the Philadelphia-based R&B group that had a megahit in 1979 with the song, appropriate for the family-themed celebration, “We Are Family;” and Catholic comedian and author Jim Gaffigan. Of course, the biggest guest of honor is Pope Francis. As the Festival of Families begins around 5:30 p.m., the pope will lead a motorcade dubbed the “papal parade” through the Francis Festival Grounds. The route will take the pope past most of the expected 750,000 people attending the festival, down one side of the Benjamin Franklin Parkway from 23rd Street to City Hall near 15th Street then back up the other side of the parkway to Eakins Oval. The pope is expected to take the stage at 7:30 p.m., where he will give an address and listen to the stories of six families from around the world. His stop in Philadelphia, which will cap his first visit to the United States after New York and Washington, D.C., begins earlier that morning. After he meets the Bowes family from Northeast Philadelphia greeting him at Philadelphia International Airport, he heads to the Cathedral Basilica of SS. Peter and Paul to celebrate a Mass for the people of the Archdiocese of Philadelphia. After the 10:30 a.m. Mass and the pope’s departure for his temporary residence at St. Charles Borromeo Seminary in Wynnewood, the festivities on the parkway begin at 12:45 p.m. on a secondary stage across the street from the cathedral at Logan Circle. Performing on the stage will be Salvation Army Songsters, Dancing with Students, Christopher Duffley, St. Raymond of Peñafort Parish Gospel Choir, Modero Dance Company, Nigeria/Igbo Community at St. Cyprian Parish, Mutya Philippine Dance Company, St. Thomas Syro-Malabar Community, Oscuro Quintet, Everything Fitz, Joe Castillo and Osage Ballet Company. The following day on the parkway, Pope Francis will return to celebrate Mass for an estimated 1 million people. Prior to its 4 p.m. start, the pope will again tour the area by popemobile but on a shorter route that has not yet been announced. Before that second papal parade, another slate of entertainers will perform starting at noon on the Eakins Oval stage as hundreds of thousands stream into the parkway area. The nine performers include Joybells of Melmark, Firehill Worship, Geechee Gullah Ring Shouters, Margaret Keys, Divine Hand Ensemble, Melanie R. Hill, Martin Doman/Christ Music, the Philadelphia Boys Choir and Chorale, and Anthony Kearns. The performances were described in Monday’s announcement as “more spiritual in nature” than the pop entertainment character of the previous night’s line up. “These acts will help to prepare the audience for the much anticipated Papal Mass,” read a press release. All the events during the weekend will be broadcast on all 40 Jumbtron large-screen televisions located throughout the Ben Franklin Parkway and Independence Mall areas of center city Philadelphia. So glad to hear that Christopher Duffley will be performing in the festivities. He is an amazing inspiration about God’s love and purpose for us all. How God could use a blind autistic boy to carry the Lord Jesus’ message is a blessing to us all. Christopher’s love of God is truly inspiring. So glad Martin Doman/Christ Music will be in the line-up. Very worshipful, praise filled music! Can’t wait to see and hear Jackie Marie Evancho sing for the Pope the rest besides the Mass is just a side show.Jackie just returned from a trip to Italy and the Vatican with Andrea Bocelli. Aretha Franklin — How does she have anything to do with Catholicism??? Good Lord I hope she is singing some Christian music like Amazing Grace, Ave Maria, Salve Regina, etc…. This is sounding more like the “Made for America” Concert….not very holy!